"Stackable Rings, Adorned Faith Stack"
We love to stack! This sweet collection is the perfect reminder of your Christian faith. 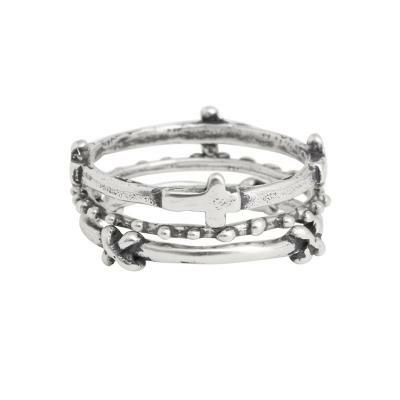 The Adorned Faith Stack is a set of three rings that will show your faith. This set makes a wonderful gift for a a friend or as confirmation gift. Make it even more special by ordering an initial ring and birthstone ring to personalize this set. Set of three rings - one faith ring, one sunburst ring and one criss cross ring. Available in size 6, 7 and 8. All rings are sterling silver. Sizing: When determining your size, we ask that you give us a size that fits comfortably. The rings are available in whole sizes 6, 7, and 8. If you are unsure of your size, you can purchase a ring and select ring sizer from the drop down menu. We will send you a ring sizer and instructions on how to email us your size. If you are between sizes you need to decide if you want the ring(s) to fit a little snug or loose. Each item is created by hand ~ from designing the original piece, to hand-stamping the personalization, polishing, packing and shipping ~ we oversee your piece from start to finish to make sure it is made with love. We design all of our products and do not use pre-fabricated blanks. This means our jewelry typically is heavier in weight making it sturdy enough to wear for a lifetime. Our signature lavender and rosebud packaging is available. So whether it is a gift for you or someone else, the surprise you get when you open the box will make you smile! Just a few people who have given our products their stamp of approval: Oprah, The Today Show, People Magazine, Southern Living, Parents Magazine and many more!